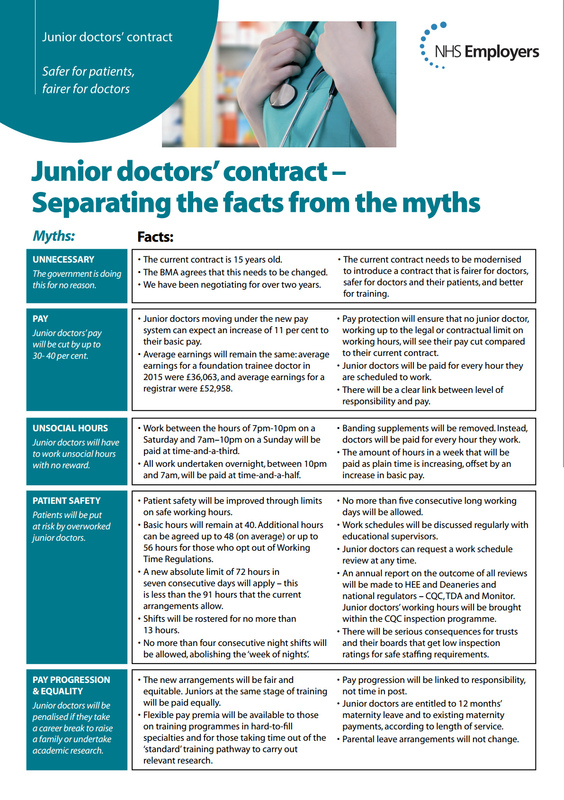 The New Junior Doctors’ Contract – Absolute Nonsense! 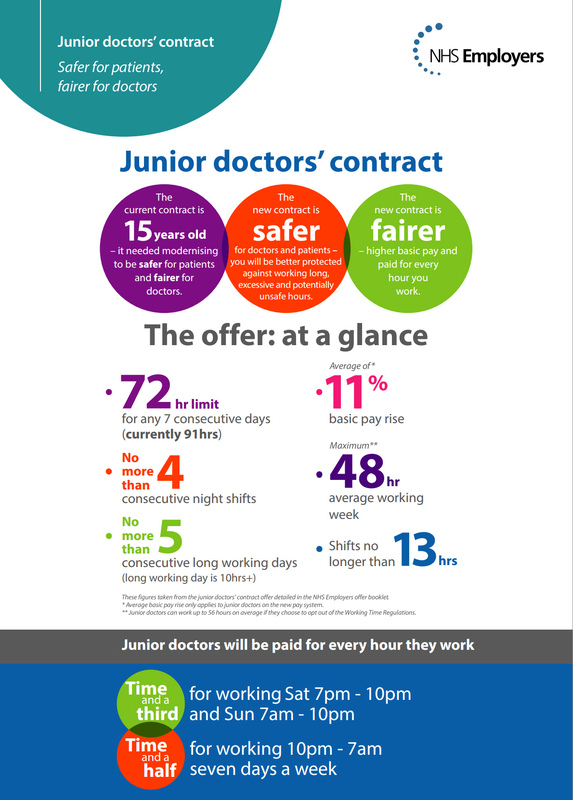 Junior doctors will be paid for every hour they are scheduled to work. Now I’m pretty certain this has always been the case. But the reality is that doctors work more than their scheduled hours routinely. How many times whilst on a surgical post, or working on any ward that has a crappy IT infrastructure have you had to come in at least an 1hr before the shift just to prepare for the ward round? The reasons for staying behind are far too numerous to list in full, but includes conducting a reliable handover, carrying out jobs you don’t trust handing over to someone who doesn’t know the patient (eg writing a referral or discharge letter), or staying on to do a ward round that the Consultant decided to start 5mins before your meant to clock off. Looks impressive doesn’t it. Well its not! The new contract looks impressive, but it’s rather deceptive. Over a 3 year period, I actually never had to work more than 4 nights in a row, 5 long days of 10hrs in a row (set by the existing rota, although I did have to when I did a rota swap), or work more than 12hrs in a day (according to the rota anyway), and my average working week was 48hrs. There are a number of doctors who have not been so lucky, and to be fair this becomes more likely as you climb ranks, but its variable across hospitals and specialities. The 11% pay rise is something new though. Time and a third for working during “working hours” of 7am – to 10pm on a Sunday is not enough. Neither is working Saturday 7pm-10pm when most of your shift will before then if you are working a day shift which often 8am-8pm depending on where you work, but is always between 7am and 10pm. Time and a half for night shifts is a bit better though, but that should be for the whole night shift. Often my night shifts were for 12hrs minimum with a start time between 8pm or 10pm. Since I don’t get paid to take a break, and that break should be no more than 30mins (and soon no more than 20mins) every 6hrs. I would be screwed out of 1.5hrs worth of pay. There is nonsense here too! Pay progression will be linked to responsibility, not time in post. Surely this means that if you repeat a year, or do not progress, your pay will not increase at all, unless of course there is a pay increase related to inflation. This is a serious problem. How can you say that a doctor has no more responsibility because they haven’t gone up a grade? This is simply not true. The fact you have worked as a doctor for another year, especially if you then work in the same hospital or speciality means that you have more experience and knowledge allowing you to work more efficiently with a lot less hand holding, micromanaging or eagle eye, non-stop supervision. Perhaps this is to prevent a failing F2 from getting paid more than a Registrar just by working for many years, but how would that even happen anyway? You would have to be a rather poor doctor if you could still be employed as a F2 grade for more than 2 years straight without progressing (only taking annual leave and a few days of sick leave here and there and no a whole year out or something) and not become a better doctor with the capability of working as a Reg after working for 5 years. Lets look at the new salaries for doctors shall we? Even more nonsense! New salaries for doctors look tempting, but not when you dig a little deeper. They do indeed look very desirable. But lets also look at how that pans out for doctors in reality. What that image fails to show is that those figures are for basic pay, not total pay. 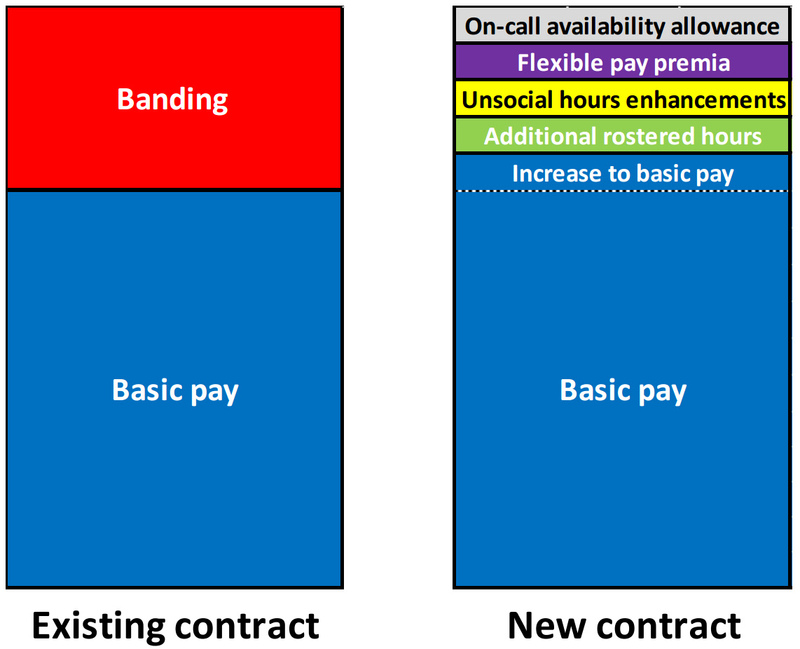 Doctors at the moment get banding as an addition to basic pay which acts as remuneration for working unsociable hours and/or in an extra stressful environment, or simply having to do a lot of work in general. Banding would often have Emergency Medicine staff earn the most at 100% banding where they work crazily long hours (more than 48hrs average) and its very often unsociable working hours, and those on GP training posts as a F2 the least at 0% when you work less than 40hrs and only between 8am and 7pm. Most other jobs would be somewhere in between, but often 20% or 40%. The banding was also used as a means to attract staff to positions that aren’t doing well at recruiting and retaining staff, or there was a sudden need for more staff working in those positions, such as the case with General Practice for donkey’s years. Look at all those extra colours representing money most doctors won’t get much, if any, of. If you are working in General Practice, Emergency Medicine or Psychiatry, you’ll get the Flexible pay premia. But no one seems to know what the exact figure of extra pay will actually be yet. Regardless, many doctors won’t get this. Additional rostered hours will most often be during “sociable hours” since they are now being extended, so the extra pay for this will be very minimal. On-call availability doesn’t exist for all doctors, and very often you are expected to simply work your hours and then rest before coming back to work. The wool is not being pulled over my eyes, sorry NHS Employers. I’m not surprised this is happening, but I am very disappointed. I never left medicine because of pay, but I certainly would have had to question why I was staying if I had to put up with this. The other major concern is how do we keep doctors staying healthy in every meaning of the word so they can do best for their patients? This sort of attack on doctors is going to harm patients ultimately, not doctors. DO NOT give in doctor comrades. Stand united and strong. Here here! Great post, thank you for breaking it down and spreading the word.